When we wrote about the copper mining ETF in late August, we emphasized that bears might have to wait through an upward correction before the fund could resume its decline. For most traders working on a weekly time frame, that would have meant adjusting stops or managing their positions in anticipation of a test of resistance later in 2018. 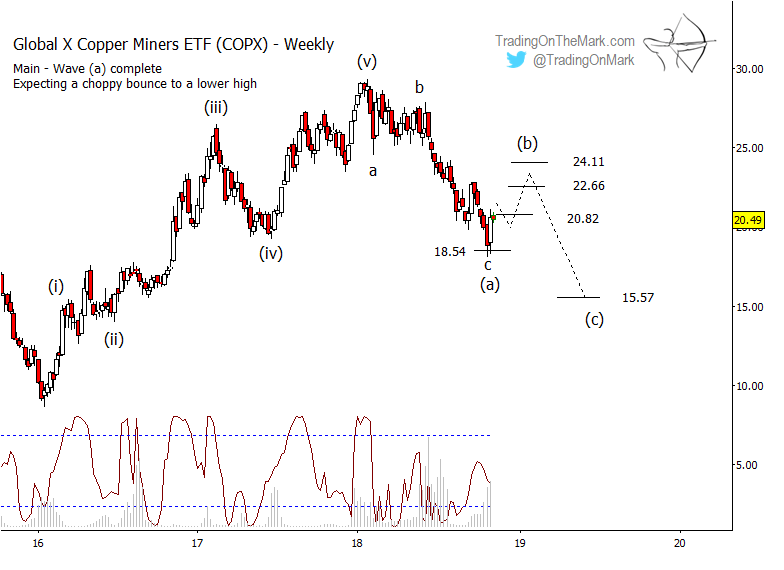 On the updated weekly chart for the Global X Copper Miners ETF (NYSE Arca: COPX), you can see that price has pushed below the support are we showed ten weeks ago at 20.82. That development doesn’t change the forecast much. We still expect an upward retrace, and we still believe there will be a new bearish opportunity in coming months. In fact, the quick rebound from the next lower support at 18.54 suggests the retrace has probably begun. To complete the setup for COPX bears, we would like to see a three-wave move up from support, perhaps to test the Fibonacci-derived resistance levels at 22.66 or 24.11. After the upward retrace is complete, we would expect a relatively forceful and persistent move downward as wave (c) of the (a)-(b)-(c) pattern following the January 2018 COPX high. To the extent that COPX aligns with the 40-month cycle that is working well for copper futures, a low might be expected around the middle of 2019. We have drawn 15.57 as a rough target for that low, as derived from the same Fibonacci calculation that produced the resistance levels shown. However we will be able to refine that target after the upward retrace appears complete. With markets becoming so volatile this year, there are fantastic trading opportunities on all time frames from monthly down to intraday. Become a subscriber at Trading On The Mark and get a trading edge with twice-daily chart updates for the S&P 500, treasury bonds, gold, crude oil, the Euro and the Dollar Index.